Grandmaster Frank J. Marshall founded this historic chess club in 1915. The Marshall Chess Club was incorporated in 1922, and has been headquartered at 23 West 10th Street since 1931. The building, a beautiful brownstone on one of the most beautiful blocks in the city, was built in 1832. It was purchased for Marshall by a group of wealthy patrons. Frank James Marshall was born in New York City on August 10, 1877. In 1895, the Marshall family moved to Montreal where Frank joined the Montreal Chess Club, quickly establishing a reputation among the leading players of Montreal by winning the club's championship. In 1896, he and his family returned to New York. Marshall immediately joined the Manhattan and Brooklyn Chess Clubs and soon became one of the leading players in metropolitan chess circles. 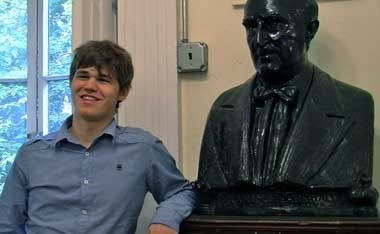 In 1897, he won the junior championship of the New York Chess Association—a considerable feat for a lad of nineteen. In 1899, he won the championship of the Brooklyn Chess Club. 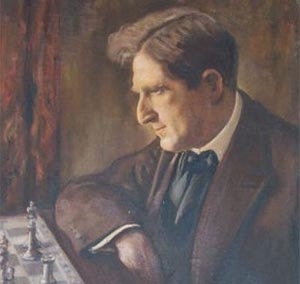 In the 1900 International Masters Tournament, Marshall met the leading masters of the world for the first time, tying Maroczy for 3rd and 4th prizes and defeating both Lasker and Pillsbury in his individual games with these titans of chess. In 1904, Marshall divided first prize with Zwiderski at Monte Carlo. Then he won first prize without the loss of a single game in the international tournament at Cambridge Springs, PA. A tournament was arranged at St. Louis, Mo., and when Pillsbury decided that he was too ill to compete, the tournament committee announced that the winner would be recognized as U. S. Chess Champion. Marshall won the event but did not officially accept the title until 1909, when he won a match with Jackson W. Showalter, the champion before Pillsbury. He held the title until 1936. One event…took on added importance as the years went on. This was the founding of Marshall’s Chess Divan at Keene’s Chop House, 70 West 36th Street, New York, in 1915. The object was to establish in New York a central meeting place for lovers of chess, much on the same lines as such famous resorts as Simpson’s Divan in London and the Café de la Regence in Paris. It was my idea to make the Divan a place of instruction where young players would be encouraged and where all chess players could feel free to gather. The friends who visited us at the Divan formed the nucleus of the present Marshall Chess Club, with its notable membership and palatial quarters. We occupied various premises from 1915 to 1922, when we decided to incorporate the club. Alrick H. Man was the first President and our first club house, purchased by a group of members, was at 135 West 12th Street. In 1931, ... the club’s present quarters and also my home, was purchased. Here we are glad to greet old friends and help to develop the young players of today. Many of the leading players of the country are members and new talent is constantly being encouraged. It must be remembered that it was in the Marshall Chess Club that such players as Reuben Fine, Erling Tholfsen, A. E. Santasiere, Milton Hanauer, Sidney Bernstein, Fred Reinfeld, Arthur Dake, Albert Simonson, Herbert Seidman and many others were developed. And we’re still continuing to turn out gifted young players! What was true then continues to be true now: many of the country’s top players are members, both adults and fast-rising young players. We look forward to meeting you at the Club and to your becoming part of its history!